1880s autograph album of Isaac Phillips Denham of Massena, Iowa. He went by the name "Phillips" or "Phil". There are missing pages in the front, including the title page, and an ownership page, if it had ever existed. Additionally, many of the pages are detached. 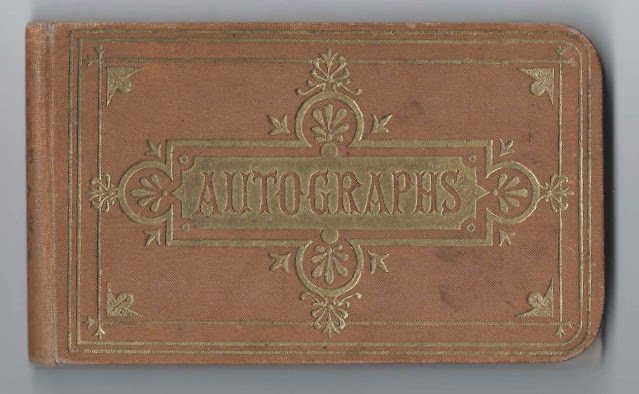 The album is approximately 5-1/4" x 3-1/8" and contains the sentiments of 21 of Phillips' relatives, friends and schoolmates. An alphabetical list of the signers appears at the end of this post. Isaac Phillips Denham was born 21 March 1870 in Bureau County, Illinois, the son of Cornelius and Harriet A. (Smith) Denham, who were born in New York and Illinois, respectively. 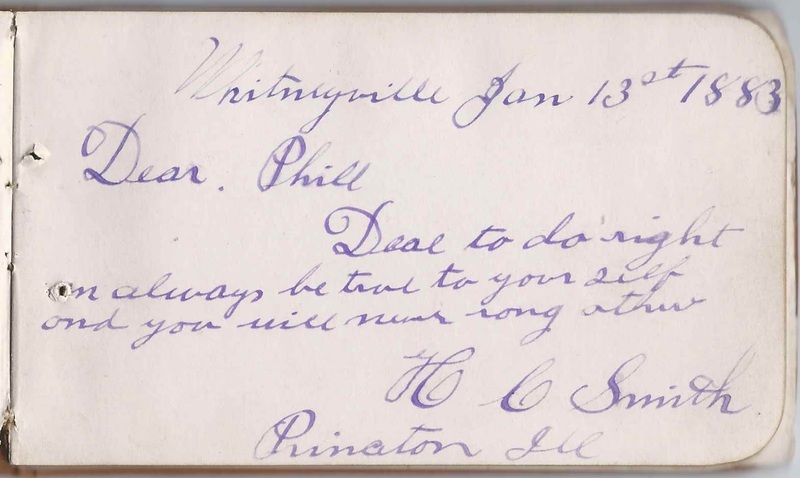 I believe the H. C. Smith of Princeton, Illinois, who signed a page at Whitneyville, Iowa, on January 13, 1883, was Henry C. Smith, a brother to Phillips' mother Harriet A. (Smith) Denham. At least three of Phillips' cousins signed pages in his album. Two were siblings Maggie and Emma Smith, daughters of Mary Elizabeth (Shugart) Smith and Allen Smith, who was another brother to Phillips' mother Harriet A. (Smith) Denham. 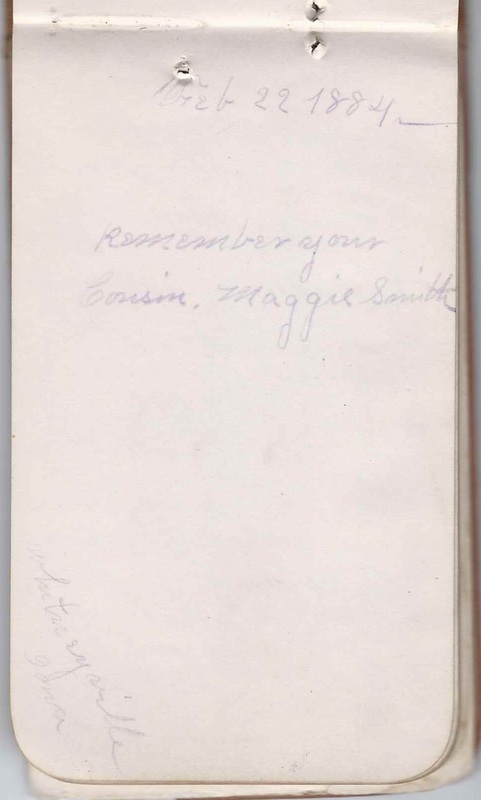 Maggie signed her page on February 22, 1884. 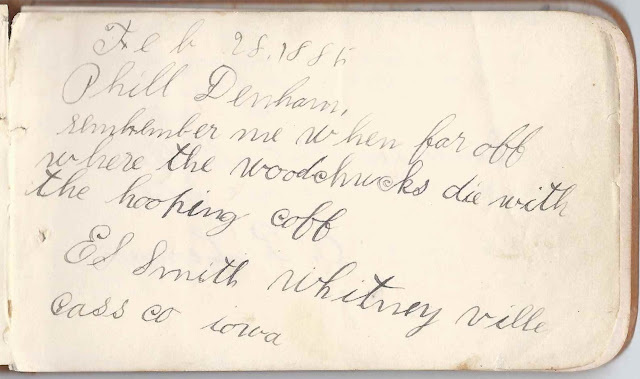 The E. S. Smith of Whitneyville, Iowa, who signed a page at Whitneyville, Iowa, on February 28, 1885, was, I believe, Phillips' cousin Eli S. Smith, son of Owen Lovejoy Smith, yet another brother of Harriet A. (Smith) Denham. On 23 December 1896, Isaac Phillips Denham married Edith Pearl Loudon, daughter of John William Loudon and Luella Almina (Robinson) Loudon. 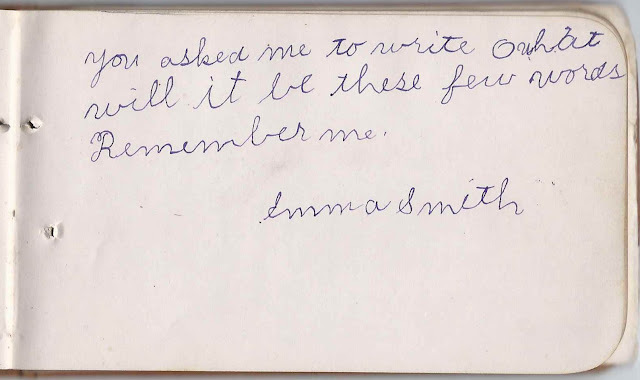 Edith was born 4 March 1876 at Massena, Iowa. Phillips and Edith, by then with two children, were still at Massena, at the time of the enumeration of the 1900 Census, but by 1910 had moved their family to California, where they had another child, farmed and stayed for the rest of their lives. If you have corrections and/or additions to the information above, or if you have information on any of the signers listed below, please leave a comment or contact me directly. Thanks! W. M. Hunter, signed on January 14, 1886. He signed the page upside down. H. C. Smith of Princeton, Illinois, at Whitneyville, Iowa, on January 13, 1883. Presumably Henry C. Smith, a brother to Phillips' mother, Harriet A. (Smith) Denham. 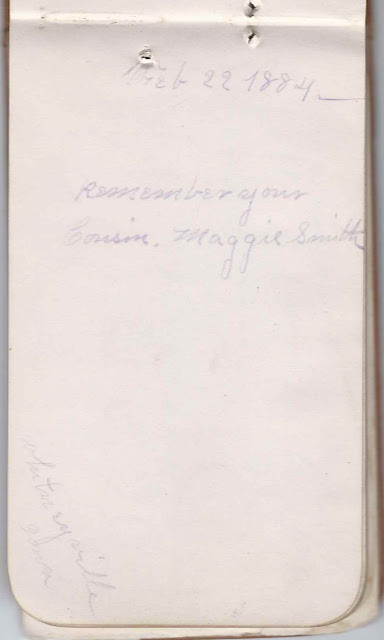 Maggie Smith, signed on February 22, 1884; presumably Phillips' cousin Margaret Smith, daughter of Mary Elizabeth (Shugart) Smith and Allen Smith, who was a brother to Phillips' mother Harriet A. (Smith) Denham. Emma Smith; possibly Emogene Smith, daughter of Mary Elizabeth (Shugart) Smith and Allen Smith, who was a brother to Phillips' mother Harriet A. (Smith) Denham. E. S. Smith of Whitneyville, Iowa, in Cass County, signed on February 28, 1885. Possibly Eli S. Smith, son of Owen Lovejoy Smith, a brother to Phillips' mother Harriet A. (Smith) Denham.